OMG. It’s been TEN years. Well, we do enough OMG-ing in the new intro, so I’ll leave it at that for now. 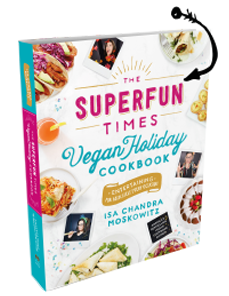 But the Veganomicon 10th Anniversary Edition is out this month, and it’s made me excited enough to update my blog! The book has been tidied up, made a little easier, and most importantly, a lot of photos have been added, all by Kate Lewis. There are also 25 new recipes! I’ll be posting some classics over the next few weeks to get you excited. Order the book on Amazon or where ever you like to support, thank you thank you thank you. Let’s start with this favorite: a potato soup with giant french fry in it! That is, a potato wedge that’s been dredged in cornmeal and lightly fried. As for the healthy part, we use kale here, but escarole or spinach would be good, too. Make the baked potatoes the night before so that you can have this soup ready in thirty minutes. Once your potatoes are baked and cool enough to handle, preheat a soup pot and sauté the onion in the oil over medium-high heat until good and brown, about 10 to 12 minutes. While the onion cooks, prep the potatoes: Slice the baked potatoes in half length-wise. Reserve three of the halves to make the potato wedges. Slice the rest into 3/4-inch chunks. Once the onion is browned, add the garlic, fennel, thyme, sage, pepper, and salt. Cook for 2 more minutes, then add the wine to deglaze the pan. Add the chunks of potatoes and the broth, cover, and lower the heat a bit to bring to a low boil. Mix in the kale. Cover and cook for 15 to 20 more minutes. Slice the reserved potato halves in half lengthwise so you have six pieces. Preheat a heavy-bottomed skillet over medium-high heat. Combine all the ingredients for the wedges, except for the oil, on a plate. Wet the potato wedges with a little bit of water and dredge the two cut sides in the cornmeal mixture. Lightly coat the skillet with oil. Cook the potatoes on each cut side for about 4 minutes, or until golden and crispy. Spray with oil as you alternate cooking sides.The soup should be done by this point. Use a potato masher to mush up about half of the soup (for once, don’t use an immersion blender; it will make the potatoes pasty and yucky), add the milk, and mix. If it’s too thick, add a little water or vegetable broth. Ladle into bowls and top with a potato wedge crouton. This is wonderful . Thanks for the share. So much more than the sum of its parts! Absolutely delicious. Thank you for posting! Argentina dominated the first exchanges but their concern fizzled out in a dreary second one half display full of fouls on both edges. For Uruguay, the quicker-than-expected come back of Luis Suarez — just fourteen days after a leg injury — cannot invigorate their invasion. Suarez authored one of Uruguay’s best chances later in the first one half after Edinson Cavani pounced with an Argentina slide near halfway and exceeded to the Barcelona celebrity. I never thought of adding roasted veg to soups this way. Total indulgence, I love it! Wonderful! I’m sure you can find something interesting on my site too, move to this if you’re interested. I love sharing my knowledge. I just love this baked potato greens soup! I will definitely gonna make this!!! Thanks for sharing!! This soup looks incredibly delicious! I’ll definitely try it myself. Thank you for sharing it! I can’t get over how incredible those potato wedges look! Also, side note, I love your cutlery! Can I ask where you got it? Whoa, this was incredible. Thank you, Isa. The broth is reminiscent of French onion soup. yummy, i though you are a professional chef. you trimmed this item very perfectly. one day i will defantely try these recipes. It would be even better with most potent cbd oil Have anyone tried it? These all the blogs are well popular and the craze of the cooking blog is also increasing day by day. One day I’ll treat my family with this delicious meal. Do you have a simple stuffed potato recipe that you would be happy to share with your readers? Look for this comment to be large scale free steam gift card for a great start the game. Amazing article friend. Thanks for your sharing this here with us. I will share it now. That’s very incredible way to baked the greens potato, by the way i want another way to do that just in short time, but still keep looking for here to find some point when i play the generador royale . This recipe seems delicious, can’t wait to try it! Thanks for sharing! Hi! Awesome article a bit caloric to be honest but in the other hand is incredible! I really liked it, especially my husband was delighted with this soup. Here I have such a question. I work as a freelancer, so I do not move much and I need to maintain my form, for this I eat no more than 2k calories a day, can you tell me how many calories this dish is? Thank you for this post. This is very interesting information for me.If you need help writing an article, contact- Paper Writing Help . Awesome recipe, It makes me hungry already :), congrats for this post! Free NCERT Solutions for the class 6, 7, 8, 9, 10, 11 and 12 for the subjects Maths, Science, Hindi, Physics, Chemistry, Biology, English, Social Science (History, Geography, Civics and Economics). NCERT Exemplar Problems Solutions for class ninth and tenth maths and science and for class eleventh and twelfth Mathematics, Phy, chem, Bio. CQBSE Sample Papers, Previous Year Papers for class ix and x maths, science, sociology, English and Hindi, for class xi and xii maths, Economics, Accountancy, Business Studies, Physics Education, Computer Science, Informatics Practices, English. Likewise download Test Papers, Notes and Assignments, Model Test Papers with arrangements, Online Study Material in PDF design. Presently transfer your Holiday Homework and get arrangements and thoughts. NCERT Solutions – CBSE Sample Papers – Exemplar Problems Download CBSE think about material, NCERT books, guides, notes, assignments and test papers with arrangements in PDF frame. No compelling reason to convey NCERT books, it is likewise accessible alongside the arrangements. We are giving some more eBooks in type of correction books, which will assist the understudies with bettering comprehend the ideas and sections. For the new syllabus of session 2018 – 2019 (which is somewhat changed when contrasted with 2017 – 2018), we will transfer essential inquiries of Class 6, Class 7, Class 8, Class 9, Class 10, Class 11 and Class 12 R D Sharma, R S Aggarwal, P K Garg, maths arrangements and Pradeep’s Fundamental Physics, eleventh and twelfth S L Arora Physics arrangements as online practice test. Arrangements will be accessible with finish portrayal of each inquiry in PDF design. NCERT Sols or the other investigation materials are being refreshed according to the understudies recommendations. Assignments of parts is additionally accessible in the NCERT Solutions area. For class twelfth, there are test in three classifications Level 1 (Easy inquiries test), Level 2 (Average and board inquiries) and Level 3 (Difficult inquiries). ghfhdfh otally Right Keep Up The Fantastic Work! Hi! Thanks fot the recipe! What’s about me, I like cooking, it’s been my hobby since childhood. And I’ve understood that during my studying period, college isn’t everything to succeed. That’s why I tried to optimize the time spent on homeworks and lessons to concentrate on things I like to do. This is a bit awkward to say, but sometimes I ordered custom essay papes from a great website and it helped me to develop while my research paper was written. If you need an essay but you don’t have a time for it – this service could help=> Speedypaper. Check it up. The blog is great. 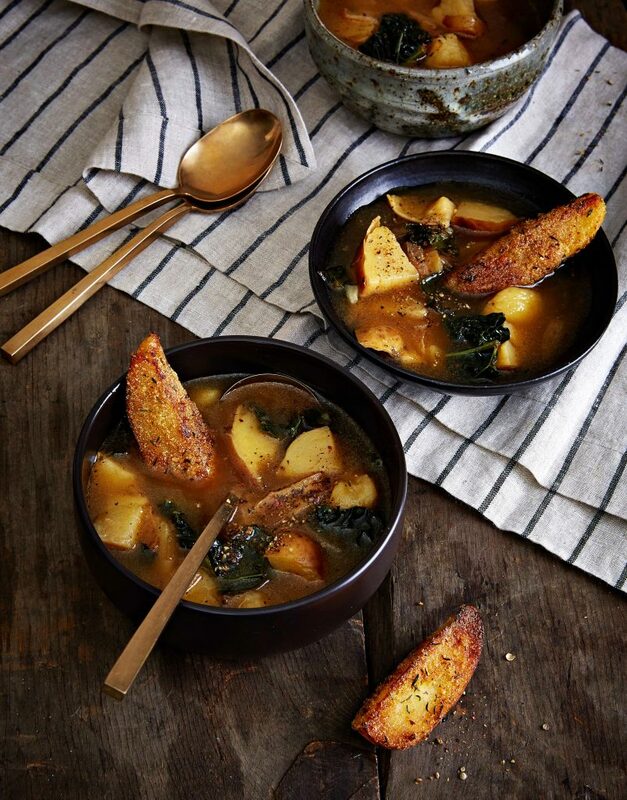 The article takes a look at the Baked Potato & Greens Soup with Potato-Wedge Croutons. Food lover will enjoy reading the article and the images added in the article will fill your mouth with water. Ingredients of the Baked Potato & Greens Soup with Potato-Wedge Croutons are provided along with the article and it will help you to make Baked Potato & Greens Soup with Potato-Wedge Croutons at your home. This co.papercoach is a students’ academic helper website. There, you will find assistance with any issue related to the study. I made this recipe it s so tasty! The potato croutons did not brown well. Thanks for sharing such an amazing post.Wonderful efforts. DO YOU WANT TO GET PROFESSIONAL COURSEWORK WRITING SERVICE? uk coursework writing> for more info. about our services.